Lux beauty bar ad. 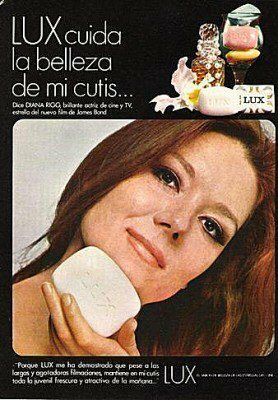 advertising Lux beauty bar with Diana Rigg. Wallpaper and background images in the Diana Rigg club tagged: diana rigg actress model lux beauty bar advertising. This Diana Rigg fan art might contain anime, comic, manga, cartoon, comic buch, karikatur, and comics. Diana Rigg in Colette ? Smile A Little Smile For Me!